If you're in the mood to shop come July 16th and 17th, here's what you should know about Amazon's fourth-annual "shopping event." Prime Day, Amazon’s summer shopping event, is back for its fourth appearance. On Monday, July 16, Amazon will offer deals for 36 hours on over a million products on its sites around the world. Bargain hunters can track all the action starting at noon Pacific time via the company’s Prime Day landing page. If you still haven't checked out Prime Day, it may sound like an overhyped "Black Friday in July" sale. But while the company did fall flat in its first year with a crop of lackluster deals, the last two years featured a selection of genuinely good tech bargains. 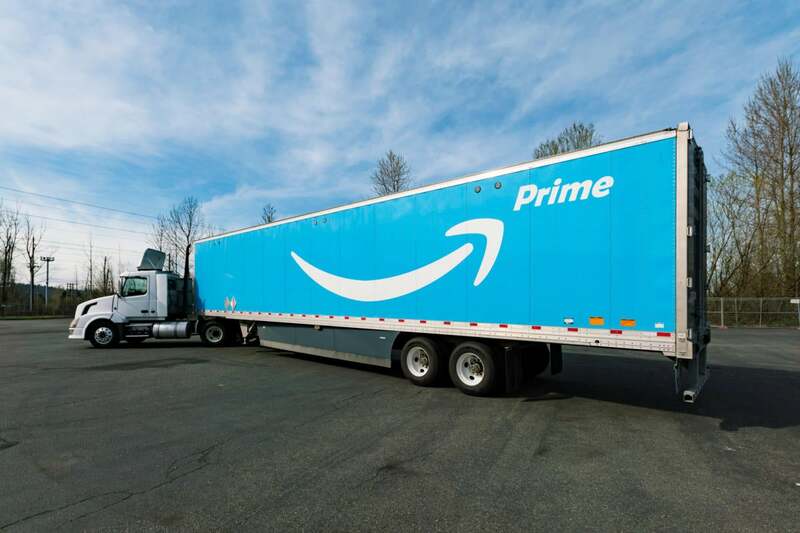 For 2018, Amazon appears to be kicking up its efforts even further and tempting shoppers with more deals, better deals, and greater supplies of the best deals—new for this year are deals at Whole Foods and a new initiative called "Prime Day Launches." Here’s what you need to know about Prime Day and how to prepare. Note: To take advantage of Prime Day sales, you must be a member of Amazon Prime. This service is Amazon’s $120-a-year club that offers free two-day shipping on orders, as well as a litany of frills like free premium video and music streaming, free online photo storage, a Kindle lending library, and various promotional offers. New Prime members get a free 30-day trial, which means you can sign up, get the Prime deals, and then dump the membership before the $120 fee kicks in. The first Prime Day wasn’t that great. Amazon introduced it in 2015 to celebrate the company’s 20th anniversary—and of course increase the number of Prime members. As for the sales, there were a few decent deals, but critics and shoppers largely agreed the day was a bust compared to the holidays. In 2016, the deals got better, but smart shoppers still had to do some legwork to separate the good buys from the bad. Prime Day 2016 was also hit with technical issues surrounding Amazon’s checkout system. There was also some stiff competition for Lightning Deals, with many of them selling out crazy fast. For its third outing in 2017, Amazon promised Prime Day would offer better deals and higher inventories yet again, plus a focus on new items—the two previous Prime Days were heavy on open-box items. But for the tech-obsessed, the deals on devices, components, and gadgets weren't as expansive as we'd hoped. Similar to 2017, we expect Amazon to launch a series of sales leading up to Prime Day as an appetizer for the main deals smorgasbord. If the inaugural deals announced are any indication, these early bargains may span a much wider variety of categories and products than last year's daily themes (e.g., Amazon Music, Everyday Essentials, Amazon Reading). Sneak peeks of select products that will receive Prime Day discounts will be available from July 9 through July 15 in the Amazon app. One free PC game per day through Twitch Prime (games announced between July 2 and July 18; claim period for each varies). The official start time is 12 p.m. Pacific / 3:00 p.m. Eastern on Monday, July 16. Unlike 2017, owners of Alexa-enabled device won't get early access to deals, but they will be able to still ask Alexa for information on "the best Prime Day deals" and the status of Prime Day orders. 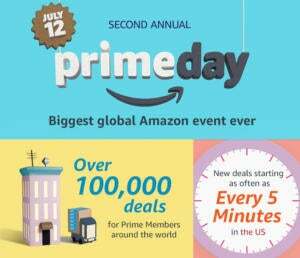 After the 12 p.m. Pacific start time, Prime Day continues for another 36 hours until closing time at 11:59 p.m. Pacific on Tuesday, July 17. (Last year, the event lasted for 30 hours.) For the east coast that means the deals stop at 2:59 a.m. on Wednesday, July 18. Fresh initiatives for this year include Smile boxes, which are available in select cities (New York City, Los Angeles, London, Tokyo and Milan). Amazon describes these as "unforgettable event[s]" that are a nod to "the unparalleled benefits that come with a Prime membership including music, video, gaming and more." Amazon is also premiering Prime Day Launches, which the company describes as "exclusive new items, content, and special-edition products available just for Prime members for a limited time." Teased items include the Delta Trinsic Touch2O, the first Alexa-enabled kitchen faucet; and the Moto G6 64GB, an exclusive version of the phone with 4GB RAM and 64GB storage. Finally, shoppers at Whole Foods Market stores can enjoy an additional 10 percent off hundreds of sale items; "deep discounts on select popular products;" and a hefty 10 percent back for Amazon Prime Rewards Visa card members between July 14 through 17, on up to a total of $400 in purchases. For their part, Amazon Prime Credit Card and Amazon Prime Store Card members get 5 percent back on all Prime Day purchases placed on either card. If you want to avoid doing any legwork, we’ll be posting our own curated lists of the best deals on electronics and tech. Just check back here or the PCWorld homepage for the links on July 16. Easy-peasy. If you plan to strike out on your own, it pays to do your research. Like any retailer, Amazon mixes true deals with “sales” that are really just regular prices (or close to it) with a deal tag. To avoid that pitfall, look up historical prices before buying. CamelCamelCamel says the best pricing on this keyboard was $90 last November, and that the highest was $170 in late 2015. 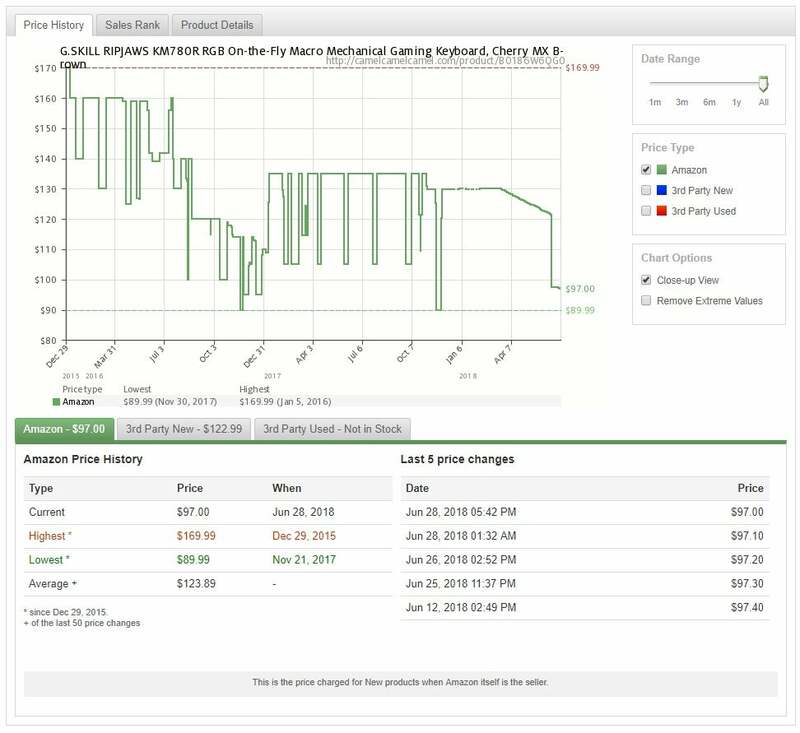 With that information and the larger pricing chart, you have the tools to decide whether that keyboard is worth the current sale price. If the sale price were $85, for example, that would be a good deal—you'd be getting the lowest price ever. A $90 price tag would also still be a pretty good deal, since it'd still hit the current lowest-ever mark. However, the graph also shows that for most of June, the price hovered at $97, which means neither discount would be cause for extreme urgency in purchasing. However, if the sale price were $60, we would advise snapping up that keyboard ASAP. With little time to buy, forget about historical price-checking in the moment. One thing you can do is look ahead, as Amazon often teases its lightning deals in advance. If you visit the Prime Day webpage, for example, you may see a carousel of Lightning Deals. Keep scrolling through those deals, and you’ll soon hit products that are on deck but haven’t yet started as deals. If you find something in those upcoming Lightning Deals you’d like to buy, that’s the time to do historical price-checking. Then when the product goes on sale, you’ll know right away if Amazon’s limited-time price is worth it. Speaking of which, you don’t have to wait around or keep an eye on the clock to know when your deals are going live. The Amazon app for Android and iOS lets you build a deals watch list and then get notifications when your deals are active. Once you’ve installed the Amazon app and signed in, go to Settings > Notifications > Your Watched & Waitlisted Deals. Activate the slider in that section. You can now add an upcoming item to your watch list—go to the deals page in the app, find the upcoming deals you’re interested in, and tap Watch this deal. Remember that it’s not only Amazon that offers sales on Amazon on Prime Day. Third-party Amazon marketplace sellers are also eligible to sell items at low prices. Many of these sellers are great, but sometimes there are less-than-honest brokers out there pushing fake or low-quality products, as The Guardian reported in April. Before you buy—even with Lightning Deals—take a second to check that the seller and the product appear legitimate. We advise consumers to only buy products that come from, or are fulfilled by, Amazon. That won't protect you from counterfeits, but if anything goes wrong, you're 100-percent covered by Amazon’s excellent customer service. With independent third-party marketplace sellers, you have to deal with them directly and can appeal to Amazon only if that effort fails. Check out the rest of the internet on Prime Day. With Amazon building so much hype, other retailers offer their own sales to compete. It’s a long shot to find the exact same deals elsewhere, but it’s always worth checking online shops like Newegg, Staples, and Best Buy for a close match. Amazon’s a great place to find deals, but not every deal is what it seems. With a little preparation and a good dose of research you can find the truly great deals on Prime Day.